Features: B & B: A/C, private baths, ceiling fans, some rooms with fireplace and/or whirlpool tub. Full breakfasts. Cottages: Located close to the bed and breakfast. Private baths, full kitchens, CATV, ceiling fans, full kitchen w/microwave. Warm, charming, inviting comfort best describe A Country Place Bed & Breakfast and Cottages. One of our favorite "finds" on Michigan's southwestern lower peninsula. For those whose interests lean toward the comfort of a bed and breakfast, John and Cindy Mainstrom welcome you to their century old, Greek Revival home situated on five acres of woodland (beach access to lake Michigan 1/2 block away). You'll find English oak and country theme throughout their five rooms with carpeting and wall coverings in shades of dusty rose or blues, touches of lace, accents of floral prints, antique furnishings and other small treasures highlighting each. All guest rooms offer private baths, double or queen size beds, ceiling fans and air conditioning. Their Windsor Room (the only guest room located on the first floor) features a king size bed and bath with jet tub. 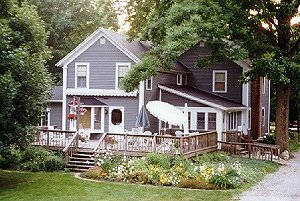 Guests to their bed and breakfast enjoy a full breakfast of home baked goodies served in the formal dining area or, weather permitting, spacious deck or enclosed porch. The most delightful feature of their two cottages (located on the same grounds as the bed and breakfast) are their bright pine interiors and restored wooded floors ... so clean and shiny you can almost see your reflection. Adding a nice touch to the cottage are homey styling and comfortable furniture. Kitchens are fully equipped including microwave, stove, refrigerator and a good assortment of glasses, dishes, cooking and eating utensils. Additional features to the cozy little retreats are ceiling fans, cable TV and screened porches. A Country Place is open from May through October. The cottages are great for private family getaways and the bed and breakfast caters to both business and adult vacation travelers.